Annapurna, as a fascinating mountain, lures climbers from around the world. Many elite climbers attempt scaling her being struck with her beauty. Sadly, only a few of them return. Annapurna is among the deadly peak in the world. To this date, 157 of climbers have successfully climbed this mountain. But, 60 climbers died while attempting. That brings the fatality ratio to a massive 38%. That fatality ratio is the biggest among the fatality rates on mountain climbings. With the high death rate, people know Annapurna range as the “Killer Mountain”. There are several reasons for being so. The remoteness of the mountain, the challenging terrains, and frequent avalanches are a few hurdles during the summit to Annapurna. Annapurna is a mountain with hundreds of avalanches. There are frequent avalanche-prone areas in Annapurna which make climbing a lot harder and riskier. Climbers have to be fully aware of the possible rapid falls of rock, ice, and, snow masses. The technical difficulties of the terrain with avalanche-prone areas can make things worse. There are difficult ice walls and hanging glaciers that may tumble any time. Mountaineers have to walk right below big ice cliffs and seracs on the knee-deep snow. The seracs can break- off anytime. So, Annapurna has objective danger as a major threat do the avalanche break-down. Several times, the overhanging and unstable glaciers have collapsed on climbers resulting deaths. The weather in Annapurna mountain is quite unstable. The mountain is extremely cold with heavy snowfall all the year round. At such a high altitude the high wind and snow storms may always bring the possible threat to the mountaineer’s life. The bad weather can hit you, trap, freeze, or even blow you off the mountain any time. So, with such unpredictable dangers, Annapurna can wipe out any climber who does undermine the unpredictable climatic condition of Annapurna. The challenging terrain with frequent ice walls and steep slopes, crevasses accounts for the high fatality rate in Annapurna. Although the terrains are not as difficult as those of K2, you encounter steep sections several times. The terrain of the mountain is quite rough and unstable. Many climbers have died due to crevasse falls or fall from a cliff. Sometimes, stepping on the unstable ground has resulted in injuries and death. So, the glacial structure and geology of Annapurna also make this mountain more dangerous than other peaks of similar height. The difficult access to the mountain by land or air during the time of emergencies has also played a role in making Annapurna more dangerous. At such a high altitude, in the middle of the snow-covered mountains, the geographic location is a huge issue. In this 60-kilometer long Annapurna mountain range, there are dozens of peaks above 7000 meters and 6000 meters. Because of this unstable terrain, the immediate helicopter evacuation / a rescue mission is a challenge if any climber needs immediate medical support. There are no nearby hospital even if one manages to bring a sick or injured climber down from the mountain. So, things get rather difficult with the inaccessibility of area if climbers need immediate support. Unlike Everest or Lhotse, local help is hard to find in Annapurna mountain. Unlike the Everest Region, it’s hard to find a frequent porter or Sherpas. There are only a few local guides and Sherpas with a good knowledge of Annapurna route. So, the limited local support in Annapurna Region has added a challenge to this expedition. The settlements are thin and the nearest human settlement is more than a full day walk away from Annapurna Base Camp. Even the few teahouses built for Annapurna Base Camp Trek are more than 4 hours walk away from the actual Base Camp. So, keeping aside the logistics and supplies, even a safe place to stay in a huge storm or bad weather is too far from the mountain. Compared to Everest and another deadly mountain Nanga Parbat, the height gains from the Base Camp to the summit is more in Annapurna. So, the turn around time in Annapurna can be different from that of those other peaks. The more time it takes you to ascend and make your way down safely, the more risk you are exposing yourself through. The Annapurna Base Camp lies at the altitude of 4,130 meters whereas the peak stands as high as 8,091 meters. So, you will gain the total height of 3,961 meters from the base camp in Annapurna. Why does the height gains matter? The less turn around time of a mountain means you will spend the less amount of time on the dangerous high altitude. At such altitudes and severe climate, even a few meters of climbing or descending takes a lot of time. So, the longer the turn around time is, the riskier the mountain becomes. In high altitudes, you have to carry your own oxygen cylinder. And due to the weight issue, mountaineers can only carry the limited amount of oxygen. So, they must to reach the top and return to a safe place as quickly as possible. Evenings in mountains turn debilitating very quickly. In such altitude and extreme climate, you frequently feel lethargic, mind fuzzes, and you find it hard to make decisions. So, every meter of your ascend and descend counts. Annapurna massif is the collection of 11 peaks with six major ones towering above 7,200 meters. Only one of them, Annapurna I rises above 8,000 meters above the sea level. And, when we talk about ascending Annapurna, this particular peak is what we are talking about. It’s interesting to find out Annapurna was the first eight-thousander that human stepped onto. But, no other mountains in the world have taken the lives of so many great climbers. Only the elite climbers attempt to scale Annapurna and more than one-third lost their lives on the attempt. On June 3, 1950, a French expedition of Maurice Herzog and Louis Lachenal summited Annapurna but paid a high price for that. They lost their fingers and toes due to frostbite and Lachenal had to go through many operations before he died falling in a crevasse 5 years later. Many renowned climbers and Alpinists have lost their lives in Annapurna. Alpinist Ian Clough, Russian climber Anatoli Boukreev, Christian Kuntner, and Inaki Ochoa are some big names. The latest casualties are a Finnish climber and a Nepali climber in March of 2015. Rescuers were able to bring a few dead ones but the rest of those mountain lovers remained there forever up in the mountain. There are several ways that climbers have died in Annapurna. Some of them have fallen from cliffs, avalanches caught some of them, some fell into a crevasse, and some of them just disappeared. A few of them died due to injury from falls and some died due to the falling off rocks. There are also cases where climbers died due to High-altitude cerebral edema (HACE) and heart attacks. Climbers also presumed one climber from Spain died due to exhaustion. With all this record, it’s clear that Annapurna is among the deadliest mountain in the world. The death rate in Annapurna is higher than the highest peak Mt. Everest, 8,848 meters. Everest has the death rate of only 6.5 percent. Annapurna tests its climbers time and again. 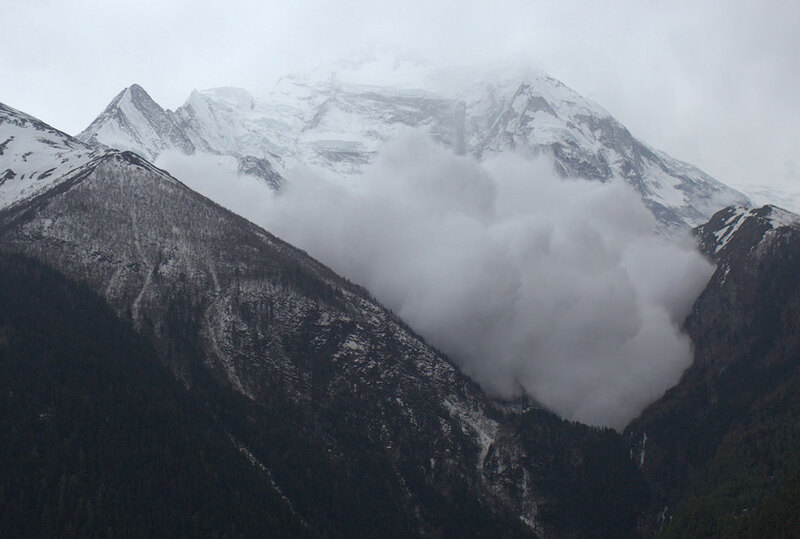 It is a high-risk avalanche-prone area with a bit of technical difficulty. Furthermore, the unpredictable weather, inaccessibility, and insufficient local support further adds misery to the climbers if any undesired event happens. This is the reason, the death rates are high in Annapurna than any other regions. But if we look at the records after 1990, the death ratio in Annapurna has fallen to 20%. With advanced technology, climbers nowadays have better boots, mountaineering gears, safety kits, and access to air rescue. After years of advancement in mountaineering, many mountaineers have overcome the challenge. Reserved for only the best mountaineers, Annapurna stands tall and proud flaunting its striking beauty. So, conquer several other mountains and build yourself as an elite mountaineer before heading to conquer this beauty.